There’s an old white farmhouse nearby. I’m certain it has a story. Its front porch runs the width of the house. It begs to tell of visits en mass, children bounding over its boards, excitement in their words and on their faces, and elderly folks in wooden rocking chairs, keeping careful watch from the porch’s covered safety. The smaller, square window on the side of the house gathers my attention every time we drive by. I wonder who peered from its glass years ago. Were they young and short, barely able to reach the midpoint of the window? Did their gaze capture the awaiting pasture view with its hungry, black cows and tall, straw-colored prairie grasses? Then there’s the swing set. Its metal frame stands in loyalty, encased by the backyard fence. I can hear the whistle of the wind as it softly pushes the swings to and fro. There are no kids riding its joy today, but I’m certain there are stories. 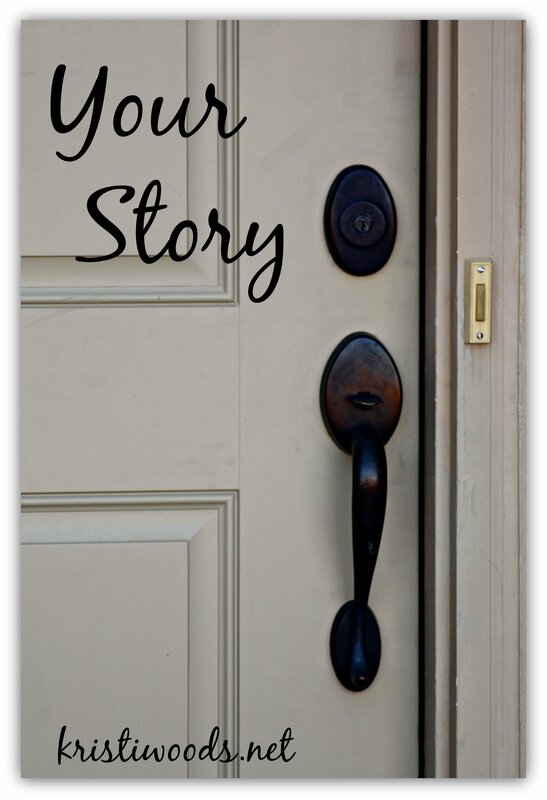 Just as there are stories within each house, our spiritual houses have stories as well. But it’s not simply for the read. It’s a call of encouragement and action. It’s a call for you and I to step off the porch, release the control, gather the trust, and walk deeper in relationship with our God. These stories are here to give us encouragement for the battle, encouragement to walk deeper. Be warned: your shoes might get a bit muddy on this walk. Real, off-the-porch faith and its steps aren’t pristine. Real faith wrestles with the grit and grime of sin, the strong self-will, broken dreams, and hearts longing for more. Be encouraged in your deeper walk, my friend. Bring your friends (tag them, forward this…consider it an invite) and come hang out on the porch here at KristiWoods.net each 1st Tuesday for Your Story. I hadn’t seen this, Kristi! What a great introduction you’ve written! I’m looking forward to this series. 🙂 Blessings on your week! Love having you here, my brave Betsy. It’s a pleasure to open the post pages to your words. And, your story? Girl, I can relate! Our first child screamed for hours on end. The dr., bless his resident’s heart, told me it was normal and nothing was wrong with Joel. After having two other children, we found out it was not normal. Dairy gets the blame.